Home of the Alpha Dogs. We pride ourselves in our training. We train often and we train hard. If you don't like to get down and dirty, stay home. We believe not only in our Great Country but in each other. upon which I am about to enter: So help me God. 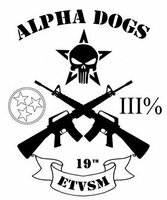 East Tennessee Volunteer State Militia is setting up a Meet & Greet for March 9th. This is to allow new members to ask questions and see the workings of our group. Hope to see you there. Contact me for location in Knoxville, Tn.